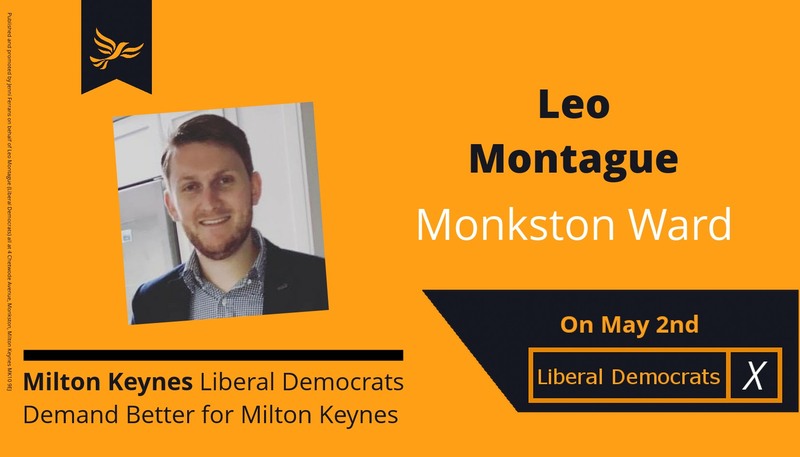 Lib Dem campaigner Leo Montague is standing for election to MK Council on 2nd May as the third councillor for Monkston ward, alongside Jenni and Vanessa. team and enjoys playing piano and guitar. joining us on the Council. Please support him, so that the Lib Dem Focus team can work even harder for you and for this area. The plans for the Walton Manor development, west of Walton Grange, between the H9 and Simpson Road, will go on display at SNAP in Bourton Low, Walnut Tree, on Wednesday 28th November, from 4pm to 8pm so that you can comment before the application is finalised. The development will comprise up to 174 homes, and a much needed play area for the area. A few homes will be accessed off Simpson Road, Walton Park, and the rest from Groveway, where we understand that a new roundabout is proposed at the OU junction. You can see the brief the developers were given here – but they are free to propose other layouts if they want. Please have a look and let us know of any concerns so that we can argue for changes. Thank you. Walnut Tree Pavilion is to have a fence round it to protect it against vandals. Everyone who responded to the consultation supported the idea, so the Council will now draw up the details. Thank you to all the residents who responded. The process to specify, procure, make, and fit the fence is expected to take around 3 months. MK Council are consulting on proposed changes at Walnut Tree Pavilion. The Pavilion has been vandalised repeatedly, and currently the toilets are out of action, which means teams can’t use it for practices. It’s not viable to keep it going unless something is done to protect it. Now the Council is proposing to erect a fence around the Pavilion, as has been done round several others, to protect the building, without interfering with public use of the car park and the playing fields. See the document attached. After that, the Council and Hertsmere Leisure who run it would like to know whether there are any more improvements that you want to help you to make better use of the pavilion – so please let them know! They are holding an exhibition where you can ask questions at SNAP in Bourton Low on Thursday 8th November from 6-7.30pm. Or you can read the document here, and reply by email to the address given. Please have your say by 15th November! The Council has published a new leaflet telling you what you can and can’t recycle. Download it here. Please note that the Council will not take ANY items left loose beside bins and bags except Christmas trees. Items that can’t be recycled include plastic bags, film food wrappings and covers, and crisp packets. Cardboard must be folded or torn up and put in the clear sacks. Any item left beside the sacks, including cardboard, can’t be recycled. Dead birds and animals can only be put in green bins if they have no fur or feathers. Wrap them and put them in black sacks otherwise please. Please recycle as much as you can. It helps the environment and keeps our council tax bills down! Thank you to all who supported us, with a special thank you to those who’ve helped us to deliver the service to you all, and to all the people who sent messages of support over the past few weeks. Now the hard work begins again! Plan:MK, which will define the Council’s current plans for development until 2031, is out for consultation until 20th December. An exhibition about it is at Kingston Library until Saturday 9th December. The Plan includes catering for the number of houses that MK’s growing population will need, and a wide variety of jobs to go with them, with most new jobs in “knowledge based” sectors, and new schools, health centres, community centres, etc. in the new major development areas as well as a major expansion in CMK. It will see MK’s population rise to 350-400,000 by 2031. All of these sites had previously been reserved for future development, and the Walnut Tree ones were in the Neighbourhood Plan, although Walton Community Council wanted a day nursery and more parking as part of the Wadesmill Lane site. All in the Neighbourhood Plan. Please have your say on the proposals by 20th December 2017. The changes that can be made at this stage are limited, but if you have serious concerns about any of it please let Cllr Jenni Ferrans know, as well as responding formally, and we will see whether we can alleviate the issues. A planning application has been submitted for the private hospital, and housing, at Kents Hill Park. You can see more details on our leaflet Kents Hill Park Plans, and the full application on the Council’s website here, and search for reference 17/02616/OUT. The application appears to allow 4-storey homes, whereas we had been assured that they would be a maximum of 3-storey, so we are asking which is correct. Either way, the actual proposals will be decided in a further, detailed planning application next year. The organisations who will manager the schools at Kents Hill Park have been appointed, and it’s good news: they both run outstanding schools locally at present. The SEN unit will function as an extra campus of the existing Slated Row school. The primary and secondary schools will be run as one all-through school, but taking in extra children at each stage, by the Kingsbridge Educational Trust, who run Oakgrove at present. Kingsbridge are consulting on the admissions arrangements for their school now, and you can have your say. The details are on their website at www.kentshillpark.school and the consultation closes on Wednesday 29th November at 5pm. the infant school will be sized for, and have catchment of, Kents Hill Park only. The junior school will have the same catchment as Heronsgate School – Kents Hill and Kents Hill Park homes will be most of the closest ones giving them priority. Children who attend the infant school will have an automatic junior place. The secondary school will have a catchment to the west of our area, plus Kents Hill Park, but not the rest of our area. Children who attend the junior school will have an automatic secondary school place. Please respond to the consultation and also let us know what you think. Thank you. They are hoping to get the planning application in by the end of September, and there will be a formal consultation (but no meeting) then, but this is your chance to request changes before they finalise the application.